Here’s a smart product from Ray-Vin.com that lets prone shooters mount their spotting scopes in the ideal viewing position. 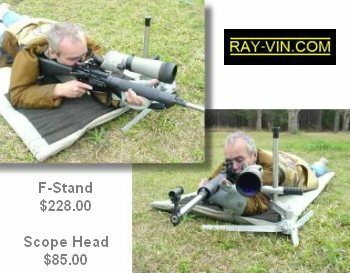 The $228.00 F-Stand is solid and sturdy, and “floats” the scope close to the shooter’s head without interfering with the placement of a front pedestal rest or ultra-wide bipod. The base can sit off the shooter’s mat. 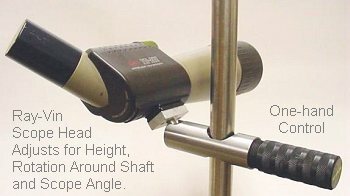 The F-Stand is shown with Ray-Vin’s $85.00 Scope Head. 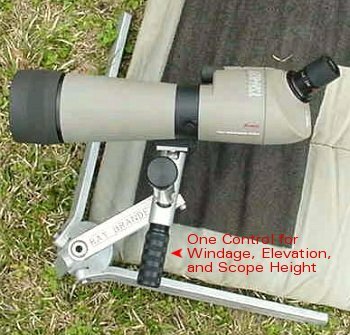 This is a very nice unit that allows the shooter to adjust scope height, rotation (around the stand shaft), scope angular elevation, and eyepiece orientation, all with one control. Some other scope heads, though more expensive, require you to use multiple knobs or friction adjusters. Conveniently, most of the adjustments can be done easily with one hand, using the black adjusting handle. Smart engineering we’d say. You can see that the F-Stand places the spotting scope right where the shooter wants it, yet the legs do not interfere with the shooting position. 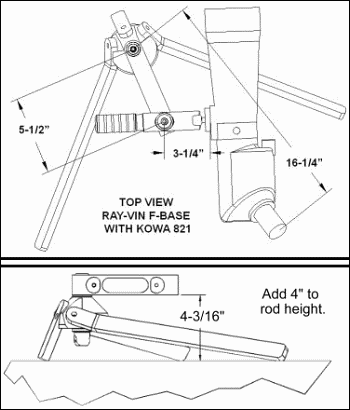 A heavy-duty milled metal bracket clamps the base stud and scope rod securely. The F-stand will hold even heavy 80mm spotting scopes without flexing. Share the post "F-Class Spotting Scope Stand"